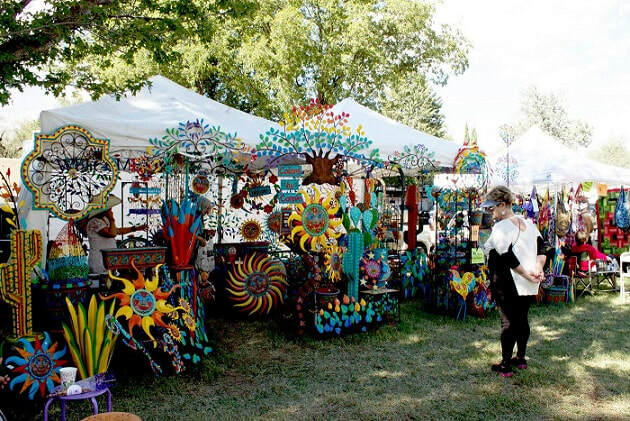 The Patagonia Fall Festival is a non-juried arts and crafts festival. All artwork must be handmade by the artist presenting and selling the materials or must directly supervise the production of the art by assistants or employees. The term “non-juried" refers to artists bringing items such as reproductions of only their own two dimensional work, production work, unlimited editions of photography, country crafts, ceramics made from commercial molds, jewelry made from purchased beads, stained glass or other items that employ the use of commercial patterns, and any item that is purchased and then embellished, including clothing. Production work, for the purposes of these shows, is defined as art or craft generated as a result of an original design by the applicant, which is then executed at an onsite facility. SAACA has the final authority to determine the classification of the applicant. ARTIST, EXHIBITOR AND FOOD VENDOR APPLICATIONS WILL BE RELEASED ON MAY 15, 2019. Artisan Gourmet Food Market: Pre-packaged gourmet food products made, created and designed for consumption. All food and beverage products must follow regulations set forth by the Pima County Health Department. Ceramic: original clay and porcelain work; excludes jewelry. No machine-made or mass-produced work is permitted. Drawing: two-dimensional works in pencil, chalk, pastel, charcoal, pen and/or ink. Limited edition prints are accepted in editions of 500 or less, provided each is individually signed and numbered. Fiber/Textiles: work crafted from fiber including fabric and paper; includes handmade clothing and clothing with surface design. All works must be designed and executed by the artist. No mass-produced work or buy-sell items are permitted; excludes jewelry. Furniture: works created as furniture in any media; no mass-produced works or kits. Glass: works made of glass that have been crafted by glass blowing, molding, casting or kiln-forming; excludes jewelry. Health/Beauty: handmade products including soaps, lotions, etc. Home/Decor: handmade products that are decorative or functional for the home. Jewelry: designed and executed by the artist and must have been juried in the Jewelry medium. No machine-made or mass-produced work is permitted. Leather: any work handcrafted from leather; excludes jewelry. Mixed Media 2D & 3D: two- and three-dimensional works that incorporate more than one type of physical material in their production. Painting: two-dimensional works in paint including acrylic, oil, watercolor, etc. Limited edition prints are accepted in editions of 500 or less, provided each is individually signed and numbered. Photography: photographic prints created from the artist’s original negatives or digital files that have been processed by the artist. Printmaking/Graphics: original works created using traditional printmaking methods including lithograph, block, serigraph, etc. as well as computer-generated art. Sculpture: three-dimensional original work done in any medium. Toys: hand-made toys of any medium. Water balloon yo-yos and marshmallow shooters are not permitted. Wood: original works in wood that are hand-tooled, machine-worked, turned or carved; excludes jewelry. Other: all works of art or crafts that do not fall into the categories listed. Original work/designs only. No machine-made or mass-produced work is permitted. Food Service applicants are juried by SAACA staff. To avoid duplication, the jury will select the best in cases of multiple applications based on product descriptions, photos and/or product samples. Spaces fill up quickly. All vendors are required to have a current Arizona TPT permit and a retail permit for the Town of Patagonia. An application for a temporary permit for the Town of Patagonia will be sent with your letter of acceptance. All food service vendors will be required to present a Santa Cruz County Health Department Permit to be accepted into the festival (call 520-375-7800) and must provide a certificate of insurance. No Food Vendor will be allowed to set up without proof of compliance. We welcome the participation of nonprofit organizations in the Patagonia Fall Festival. As a community event, we extend an invitation to organizations from the Mountain Empire of Sonoita, Elgin, and Patagonia and our neighbors in Nogales to participate as a way to promote your group, get your message out, and to fund-raise. Organizations from other communities may be accepted on a limited basis. Nonprofit retail sales are limited to items related to the mission of the organization unless special permission is granted, please ask. A discount is offered to nonprofit organizations with an information only booth (raffles and donations allowed). As this event is held on private property, as of May 1, 2018, campaigning activities will not be permitted at the Patagonia Fall Festival. All organizations, for-profit and nonprofit, are required to have a current Arizona TPT permit and a retail permit for the Town of Patagonia if selling items. An application for a temporary permit for the Town of Patagonia will be sent with your letter of acceptance. Proof of nonprofit status will be required. Business is defined as independent contractors, in-home businesses, as well as the typical business that has a business office or storefront. This booth type is considered to be a business which is selling manufactured, commercial, or third party sold, or business trade and sales organizations. 30 years ago, the Town of Patagonia held its first fall festival to showcase extraordinary talent and artistry against the beautiful backdrop of their community, nestled at over 4000 feet in the mountains of Southeast Arizona. Now in its 30th year, the festival attracts more than 15,000 visitors to Patagonia’s lovely tree-shaded park in the center of town over a festive weekend, presented by the Southern Arizona Arts & Cultural Alliance in partnership with the Sky Island Tourism Association.